When you're sending messages to your clients, it's important to sound like... well, you! HoneyBook provides some built-in email messaging suggestions to get you started, but most importantly, we always allow you to review and customize email communication before your files go out. HoneyBook Tip: You can also create your own Email Templates to save you time—while still keeping all communication in your unique voice! 1. When you're finished creating your file, click Next: Review Email. Format the text with bolding, underlining, etc. 3. You can also choose from a list of Email Templates—remember, you can also make your own—by clicking the Templates menu. 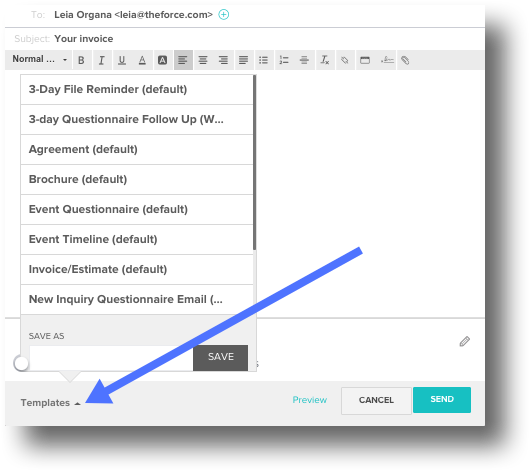 The body of the email will automatically update when you select a Template. HoneyBook Tip: Click the Preview button to see what your client will see! 4. Click Send when you're finished with your edits! What kinds of Templates can I create?